The holidays are fast approaching, we are in the predicament of what to give to our children that would last longer something that they would also feel part of it. As well as Grandparents, Aunts and Uncles. For me, I think there are so many awesome things to get to our children, there are big or small gifts. As long as we won't forget and remind ourselves what truly is the meaning of the holidays. Anyways, we thought about getting them something unique, educational and of course something that would mark it as theirs. A personalized items would be a unique and interesting thing to do. Today, I have the opportunity to make this thing possible. Yes! I have the chance to choose the book as well as an ornament for my two adorable boys. Our 5 years old can read fluently and he loves to read as well. So, a personalized book that has his name and his friends and family in it would be a great Christmas present. 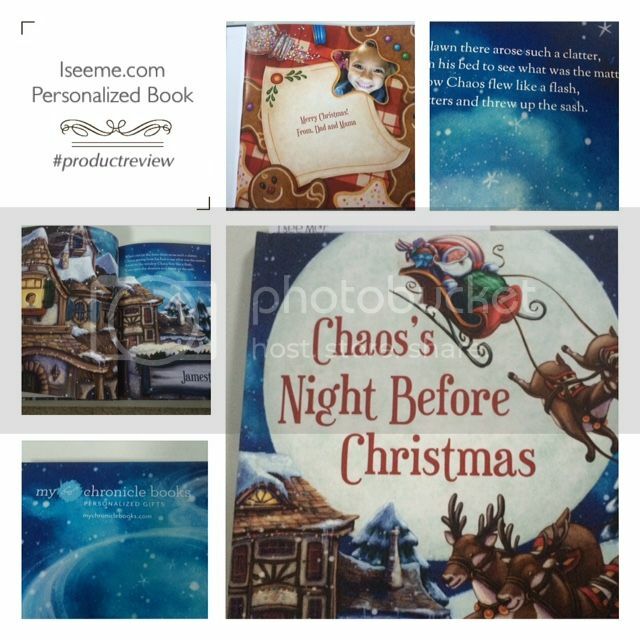 I choose the book Titled: The Night Before Christmas from ISEEME.COM. Personalizing the book is very easy, all you have to do is go online and fill out all the information needed for the book. You can see from there the pictures of the book and how the information filled into the book and when you are satisfied and ready all you have to do it to submit the filled out information and you are set. That's how things work when I did the personalized book. It never took me an hour to do it, of course, giving out the information is way too simple and quick. We can only hope for the expected outcome. The product arrived in the mail via the USPS. Secure packaging that I didn't see any signs of damage in the shipment that I was able to read and check the personalized book itself, it also came with the personalized ornaments I requested. · The binding of the book is great. The prints, words, paper, pictures are absolutely perfect. It is something that you can brag about how wonderful the book is made. · Very satisfying, the image of my son on the first page is also in high quality. · You can tell that the entire book has an excellent high resolution. · The covers are also sturdy, hard and in an excellent condition. · The story is fascinating, as a mother I wanted to make sure that it would be a story where a child's imagination would widen and this book indeed is. · The information that I have provided were all correct. · The material being used is great, the image/photo that is in the ornament is also in high quality. · Very light weight, easy and ready to be hung on the Christmas Tree. · The prints are also in an excellent outcome. I would say this is a wonderful experience for my first time to acquire a personalized book for my son. It would be a great Christmas gift, birthday gift to a child. They would feel like a Star because they knew it was their name or they are the main character in a story of a book. I would highly recommend this product and would definitely purchase a different personalize book for our second child. Books are the perfect gift for kids, what more if it's personalized! One of the best gifts we can give them is the gift of reading. I also got this for my daughter. I love their books! I love this idea of a personalized book and oranment! I hope I can find something similar here. My son will be ecstatic to see his name and his friends' names in a story book. I'll check out this website. Thanks for sharing! I would lovethe ornament, I was late though so I did not get to order any. It's always so nice to give story books to kids. This season we're filled with amazing stories that kids will definitely love! I do not have small children anymore but I do have cousins and friends who would love to have these I See Me books for their children. I will share this post with them. Awww! This is such a sweet and pretty book and ornaments for the kids on Christmas. I bet your handsome boys love to listen to the story.